You must make bookings at least 5 minutes in advance of the time at Bisque Brasserie. Bisque is a local neighbourhood restaurant serving casual gourmet food. It's located in the Bruntsfield area overlooking Bruntsfield Links park, just a few minutes walk from the Kings Theatre. We're open for lunch and dinner every day with varied menus from fixed price to light dishes & snacks to a full menu. Menus are seasonal and feature locally sourced produce. We also have a great value kids menu. Dine in a booth in the bar, in the restaurant area or on the garden terrace. Afternoon tea for £14.95 or £19.95 for Prosecco Afternoon tea. Terms and Conditions: Maximum of 8 diners. Includes Tax, excludes service. Maximum bookings for entire day is 50 for each deal. Cannot be used in conjunction with any other offers or promotions. 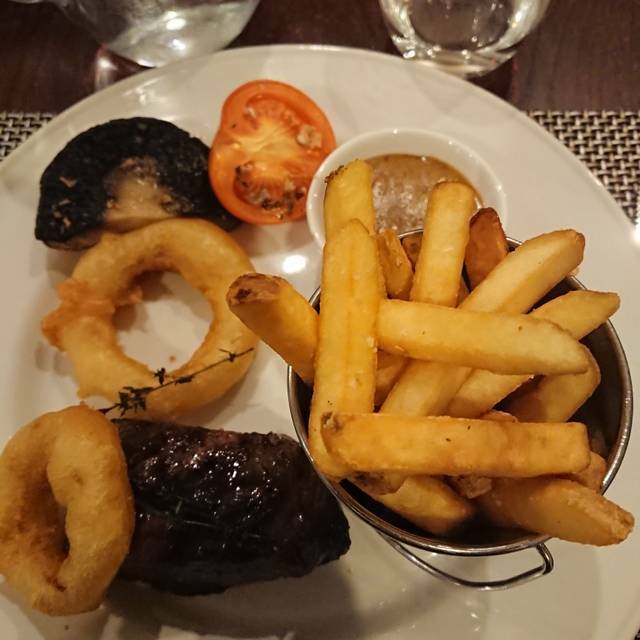 5oz steak and fries served with a drink (from a set list which includes a 175ml glass of house wine or pint of larger) for £11.95. Terms and Conditions: Maximum of 8 diners. Includes Tax, excludes service. Maximum bookings for entire day is 50 for each deal. Cannot be used in conjunction with any other offers or promotions. Accompanying drink with Steak Night deal from a pre-set list of drinks. £14.95 for two courses from fixed price menu. I really liked the food here - the restaurant itself lacked atmosphere and felt like a hotel restaurant. The area close to the outdoor area was closed off so maybe it would have been better when this is open. Delicious flat iron steak with mushrooms, tomato and chips along with a glass of wine on a Thursday night special offer. We were heading to the Kings theatre and this is the perfect place to dine beforehand if you book a table for 5.30pm then there is no rush. First time I've eaten here and it certainly won't be the last. I had the flat iron steak with peppercorn sauce and it was to die for. I have my steak medium rare and it was cooked to perfection. The service was good, very friendly staff and a lovely atmosphere all round. I would definitely recommend. A massive 5 stars. Nice and handy for the King's Theatre, just a short walk down the hill. We got a very cheerful and friendly welcome and when they knew we were going to the theatre, they timed everything perfectly. There's a very reasonable pre-theatre menu and a not too pricey wine list. Overall, a good dining experience. Recommended. Food was good, service was very poor, over an hour and a half for just starter and main course. Waited 15 mins to receive a desert menu. Although the food was good, came here hoping to enjoy the pre theatre menu which appeared to be unavailable and the service was very slow. This place used to be good, but not anymore. We were a table of 8, seated towards the back of the restaurant all alone. The two waiters were young and clearly not trained in how to serve, a management issue more than their issue. Service was slow and lunches came at different times for each of the 8 people. When clearing the starter and main courses, the waitress was able to only carry two plates at a time, once in each hand, not trained at all in how to carry plates. With the distance back and forward to the kitchen, it was taking ages to clear the table. Not once were we asked if "everything was OK with food or whatever"
We asked for the bill and left before coffee and desserts. Service charge was already included as a table of 8 I guess, but when paying we were presented with "do you want to add a tip?" … maybe automatic, but was too much. There was no point complaining to the staff serving as they were too inexperienced to deal with it. And we did not see one manager, as we were at the back of the restaurant and presumably they were at the front and were unaware of the how the service was towards the back. Good Place for families but not only. Regular food cooked very well. Very disappointing. Ordered afternoon tea for 4 people, were told we couldn't have it all at the same time. Had to wait ages for the other half of our food. Clotted cream arrived with a thumb print in it and covered in jam. Sandwiches stale and tasteless. Cakes were bland. Pretty sure it was still defrosting.... Food nothing special. Terrible table service - I think we knew more about the menu than they did??? Would never go back. They took one afternoon tea off the bill, and gave some dreadful excuses but honestly I think they were embarrassed themselves. We've been coming here quite a few times recently, and always been pleased with the food and service. Excellent food, very affordable pricing , polite service. Soups were excellent and so were the Rib Eye and Lamb Shank. First time to this restaurant, as it was near the theatre 🎭. The decor and lighting tastefully done. Good food selection and very delicious,good choice of wines and service was good not too in your face! Would definitely go back . We were staying at the hotel next door and had breakfast and dinner here each night. It is an excellent restaurant, friendly service and delicious food. Cannot highly recommend this place enough. Lovely food and great service - we had a lovely family meal here! First visit and would return as lovely food and great value for money. A nice relaxing atmosphere and friendly staff. We go every year before the Panto and all was fine as usual! Poor venue with little ambience. Food unexciting and pork escalope was most unappetizing looking. We had a great Sunday Lunch - very good roast beef, although the veg were a little undercooked for some members of the party. The atmosphere was very good and the service was friendly but not efficient. We were shown to our seats which was nice and our coats were taken for us. The waitress came for the wine order before we had chosen our food and stood till we decided. My venison casserole tasted very good and was nicely presented, however it had two qualities of meat. Some pieces were tender and just fell apart, other pieces were sinuy and tough and I could not even cut the pieces. Half was like this. I could have imagined that the dish had been topped up with new meat cooked at a different time. The risotto was very good indeed. The vanilla ice cream had not the least hint of vanilla in the flavour. The lamb shank was tender and full of flavour, but the vegetables were wel overcooked. The Manager removed the cost of the venison from our bill and apologised. Went to The Bisque with a group of friends having attended the matinee of the panto. The service, food and ambience could not be bettered. Having attended the Bruntsfield Hotel on a regular Friday night for a nightcap after dancing we decided to give The Bisque a try since our experience had been so positive. We were not disappointed. The staff could not be more pleasant or helpful especially when compared to a nearby hotel where we were made to feel an inconvenience. I would certainly have not hesitation in recommending The Bisque. We were a party of nine including one child and a toddler.The variety in the menu was superb and the standard of the food was excellent. Staff were attentive but not obtrusive and we would strongly recommend this place as a child friendly restaurant with extensive menu. I booked Bisque Brasserie as part of a visit to Edinburgh and attending the Kings Theatre which is a few minutes walk away. I had no idea what to expect and one of the first things to note, in case one missed it from the address is that this is part of the Best Western Hotel and in their downstairs, so not so easy to find. That said having arrived and in a rush the staff were really helpful and friendly. They asked if we were time constrained and were very swift with their service, without being pushy. The food was very good where I had the soup and my friend the lamb and courgette salad to start. As we both ordered from the £15 menu, we chose the lemon risotto which was very zesty and the best risotto I have had out (often they are really disappointed). Given the really good price tag we were delighted with the find and would recommend to others. We had not been for some time so it was almost like a new restaurant. Everything was excellent particularly the service which was attentive without being intrusive. My wife and I had a lovely dinner in this restaurant. The food was very tasty, there's good selection of starters, mains, side orders, etc. There are also good selection of wines, although I ordered beer because I wasn't feeling like I wanted wine that day. The ingredients seems fresh hence it is very good. Location was great as well as it's well within the city centre. Just being beside a hotel, couples could have an option to book a room together with dinner for special occassions. I didn't book a room because I live in Edinburgh. The staff were very friendly, cheerful, and helpful. We felt we were very much welcomed. Overall, I recommend this restaurant for special occassions, or just whenever you feel you want great food. We had an early evening dinner in the restaurant. It was busy for a Saturday evening which I guess may have been guests there for pre-theatre dinner. The menu had a good choice, service was first class and it was value for money. Only had a main course and coffee so didn't out the full menu. Dined here before. First time we've had lunch, which suited our attendance at a theatre matinee. Lunch menu is good with a mixture of light bites, combos and fuller meals. We went at the restaurant at eight o'clock pm. We arrived 20 minutes before and the table was ready. After two wonderful seafood starters we order a beef as a main course. They were very good. Then we try two desserts that were really incredible. We visited this lovely restaurant for my mum's birthday. The staff were very firendly and efficient, the food was very tasty. We got 5 different starters and mains. The kids food was very good as well. They even sang happy birthday on put a candle on my mums dessert. Fantastic restaurant, wasn't expecting it to be so good. Staff very friendly and extremely helpful, took time to make sure everything was ok. Explained the different types of whiskey on offer, 60+ malts to choose from! Excellent place to be with a partner. Very cheerful people working and nice ambiance. The food was tasty, service was quick and friendly. Looked like they have a nice outdoor area. Thought this was a restaurant in its own right when booked, and it was a little odd to trundle through the hotel to reach it. Having said that, the service was good and the food was nice. It was pleasant enough and pretty reasonable. We all left very satisfied with our meals, and they were very good about booking us taxis.